Wolfatek Review 2019: Is Wolfatek a Good Hosting? 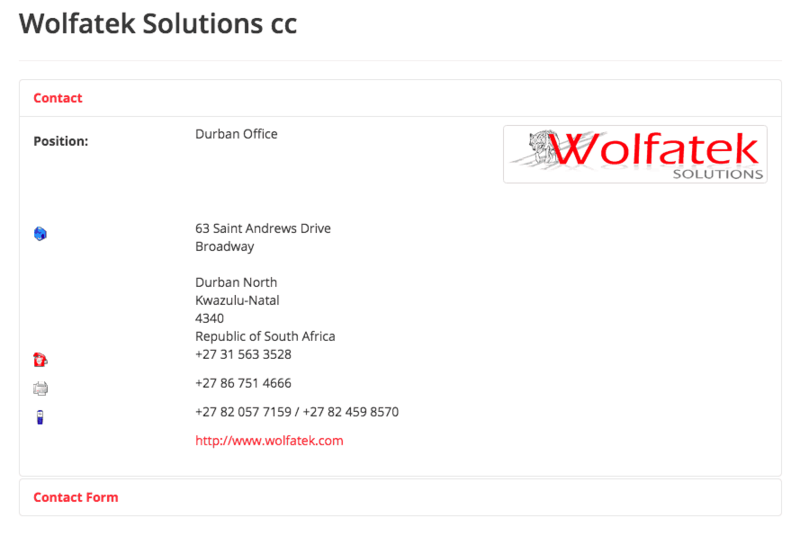 Wolfatek is a long-standing South-African company offering a selection of I.T. services. The shared hosting plans are vague, so it’s hard to comment on the quality. Wolfatek is a Durban-based company which was founded in 2003. As well as hosting, it does computer repairs and I.T. services in its local areas; Durban, Umhlanga, Ballito, and Durban North. The company’s website is available in English. Wolfatek provides hosting services which are primarily targeted at businesses. Unfortunately, some of the statements of the website are quite vague and I wasn’t able to get any clarification from customer service. Wolfatek has its servers colocated in multiple data centers in different South African locations. Apparently, it has access to “some of the fastest connections in the country” and high availability (the percentage is not specified) as all servers are duplicated into backup servers, in the event of failure. If you purchase a shared hosting plan, you benefit from control panel access, which means you can add or remove email accounts, change email passwords, set up FTP access, install website applications, and so on. 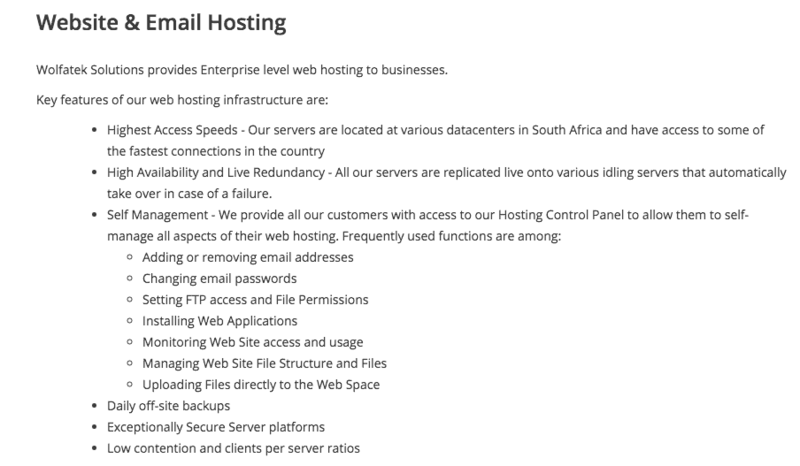 Essentially, the same features you’d expect in any self-managed shared hosting plan. It’s less clear if there’s support for PHP or beginner-friendly features like a website building tool or a one-click installer. However, if you need to scale, there are VPS and dedicated server packages, as well as the shared hosting plans. Unusually for a shared hosting company, you can’t purchase the plans online. Nor are the prices advertised. As I didn’t receive a reply from the company, I am unable to comment on the prices at all. I also can’t comment on the payment terms and whether you can choose a month-to-month contract or a longer term discounted option. Neither can I tell you if an SSL certificate or domain name is included, though I’d assume not, to be on the safe side. Customer service is available by phone and email only, with the hours limited to Monday to Fridays from 8:00 a.m. to 5:00 p.m. There are no help documents on the website, so if you don’t get a response from support (like me! ), then you are left waiting. Wolfatek offers a decent range of hosting services including shared hosting, VPS, and dedicated servers. However, with the lack of information on the website and the poor customer service, it feels like the company’s focus is on its local I.T. services and hosting is a secondary product. Wondering how Wolfatek stacks up against other Web Hosting companies? Enter any other Web Hosting company and we will give you a side-by-side comparison.